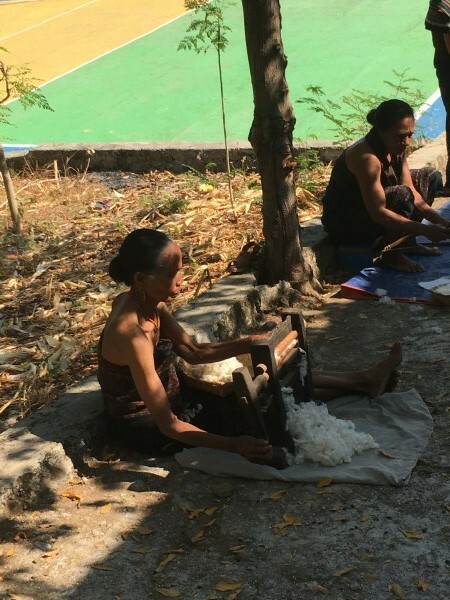 In May 2018, I went on a textile tour to the Lesser Sunda Islands, organised by Sea Trek with Sue and David Richardson (UK) as textile experts. 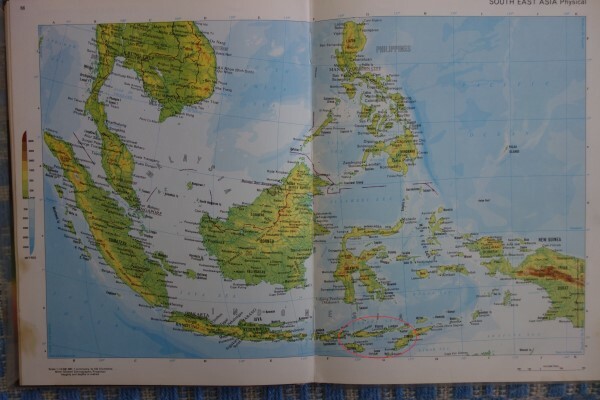 To put it all in perspective, here’s a map of Indonesia with the area to be visited identified. 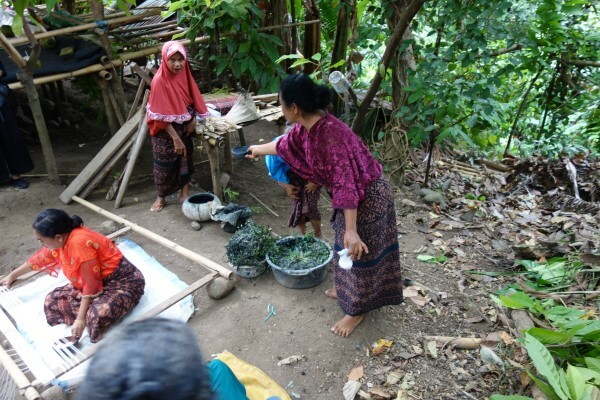 There was a 3 day pre-tour land based tour that started in Ende, Flores. 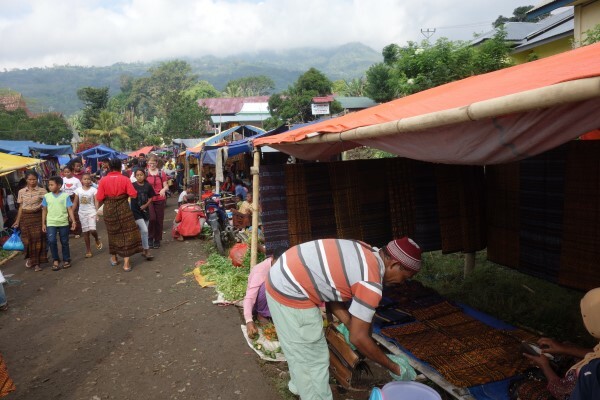 We then crossed the country to Maumere, visiting Ndora, Kelompok and Nggela villages. For those who wished this could be taken independently or omitted. 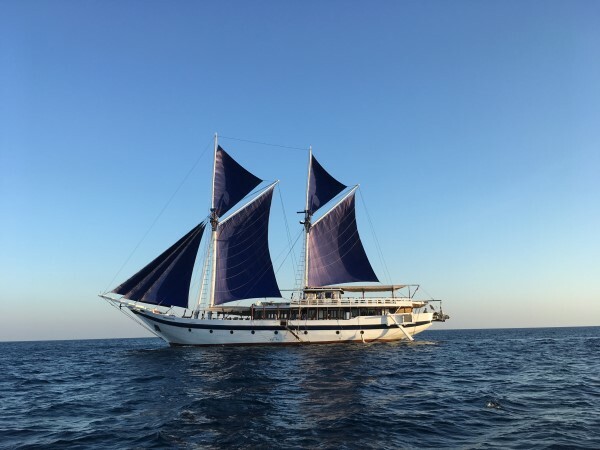 This was followed by a 13 day cruise around Flores, Lembata (formerly known as Lomblen), Alor, Pantar, West Timor, Savu, Raijua, Sumba before returning to Flores. This map, supplied by Sea Trek shows where we went. 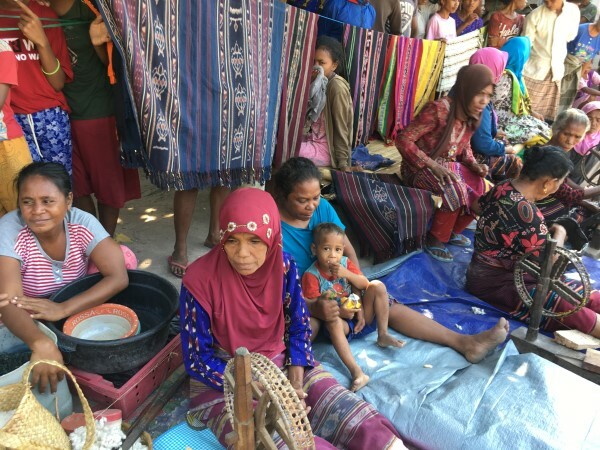 I had long wanted to explore Flores and Sumba in particular as some of my friends had already been there. 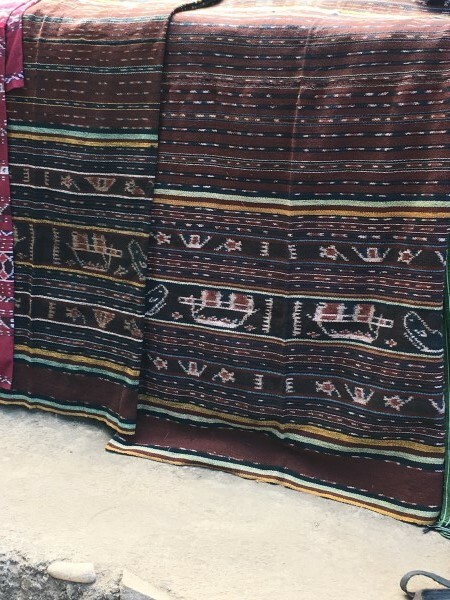 I had seen the textiles that they had acquired and had heard their stories and I was fascinated. I hoped to see some similar as well as researching how they were made. 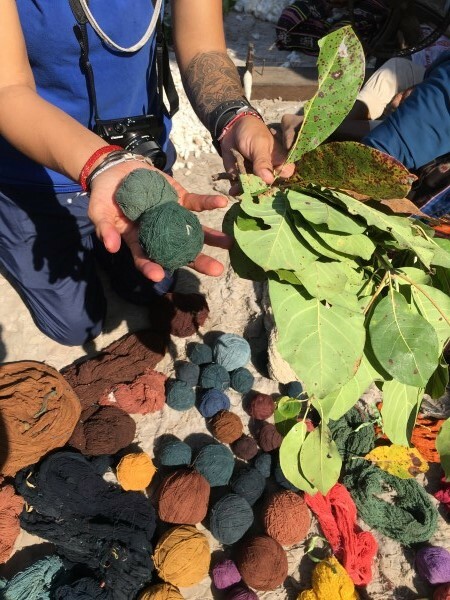 In addition it was an ideal way to get an overview of textile production on the smaller islands. In all reality visiting these would be unlikely otherwise. 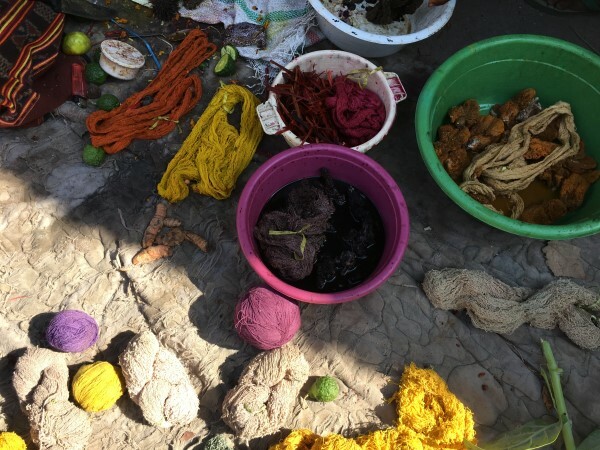 In essence, I thought that this trip would be an ideal opportunity to gain an overview of textile production in this area. It would also inform me of any area which I would like to revisit to do more in depth research. 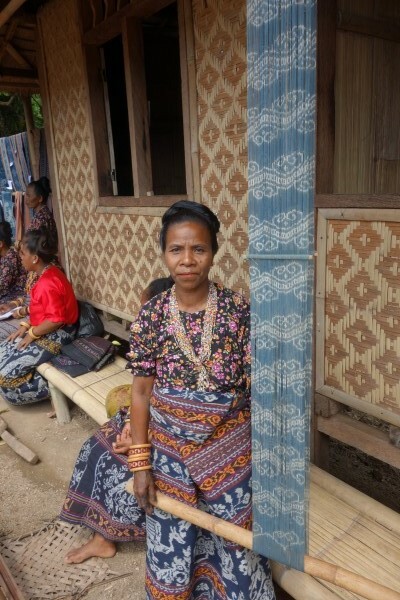 And I’d get to revisit West Timor which I had thoroughly enjoyed in 2007. In addition Sea Trek provided two guides, Anastasia and Narto. They were wonderful: professional, friendly, extremely helpful and obliging. 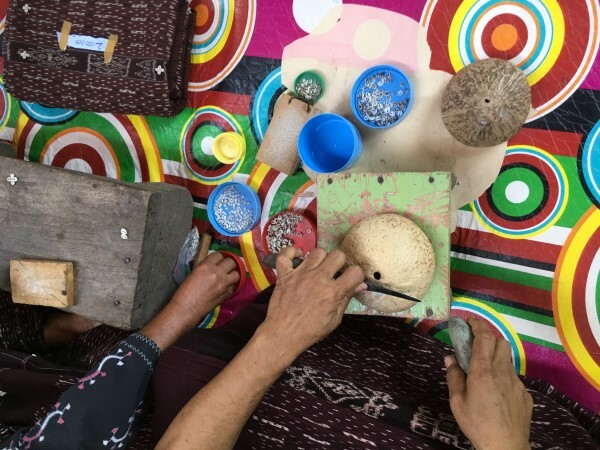 A tour can really be enhanced by the local guides and they certainly filled that category. I’ll also mention the wonderful staff on the boat. 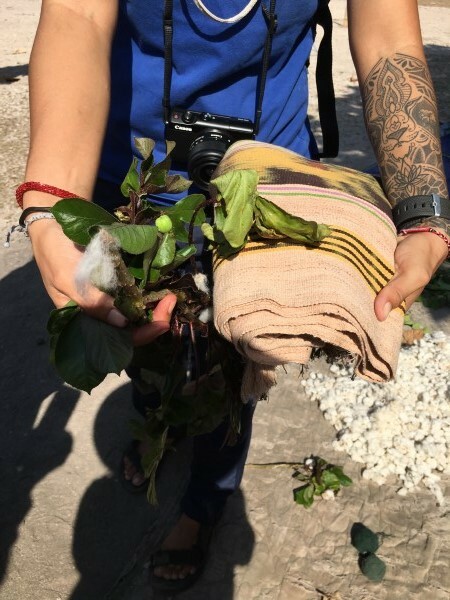 It was a truly wonderful experience because of their friendliness, care and willingness to go out of their way and help. 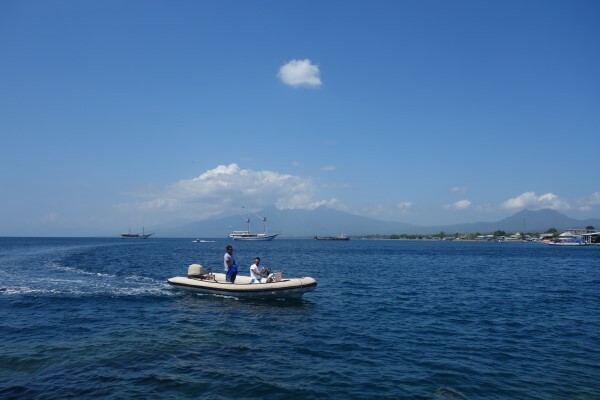 And the boat, Ombak Putih – what a truly wonderful way to get around the islands. Sea Trek run other cruises. I’d highly recommend the experience. www.seatrekbali.com . There were 14 on this tour. It was a great group to get to know. Everyone was widely travelled and all with interesting stories. To get to shore we were taken by these zodiacs. I will divide this blog into two main sections: one covering the volcanic islands, and the other; the limestone ones. Yes, there are many active volcanoes in this area. Some were even “smoking”. 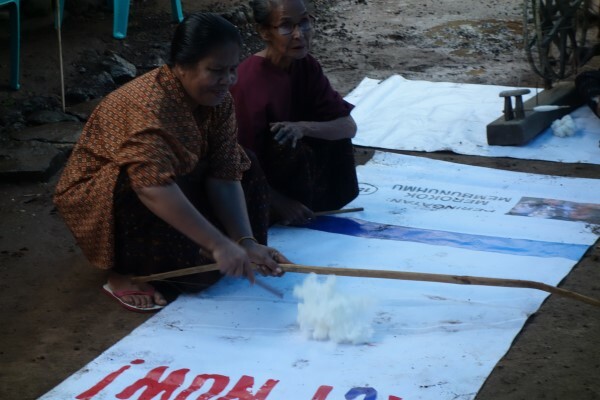 They are all on the northern side of the Savu Sea. The other islands on the southern side are limestone. 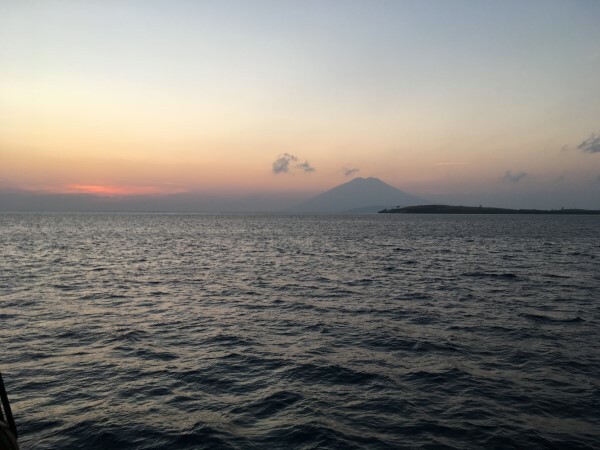 This is late afternoon cruising with a volcano in the background. Before starting though, I’ll do an overview of traditional dress. 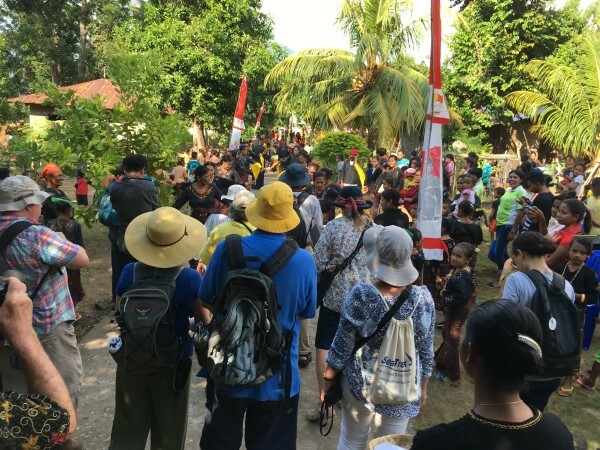 Usually when we visited a village, we were given a welcome event with everyone dressing for the occasion. I guess after all here is their opportunity to show off to those foreigners and perhaps encourage income. This is just one of our many welcomes. 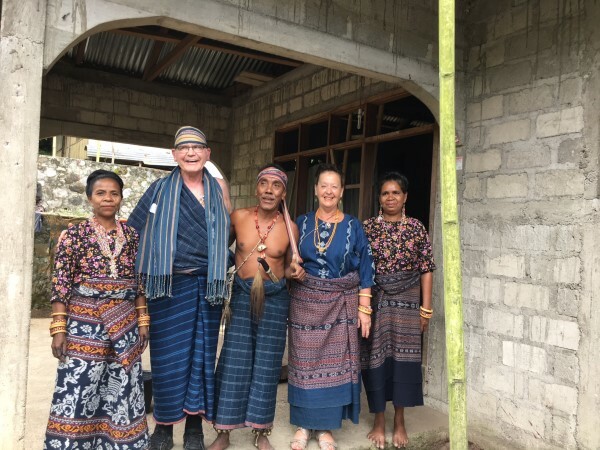 At Dokar (Umauta), Flores, our two representatives, Irene and Phil were taken and dressed for the occasion. 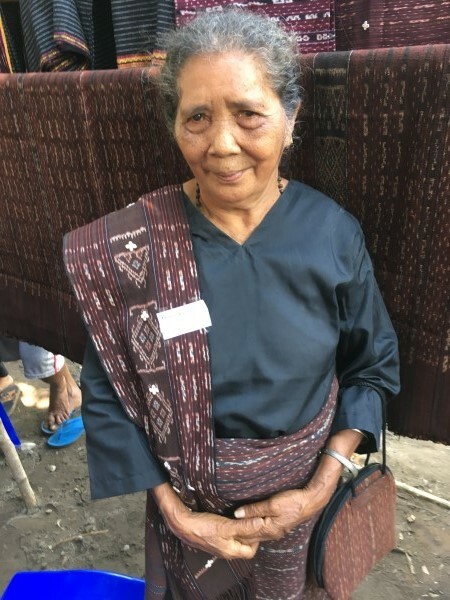 This picture will illustrate the requirement of traditional dress for both men (a sarong and shoulder cloth) and women (a tubular sarong). 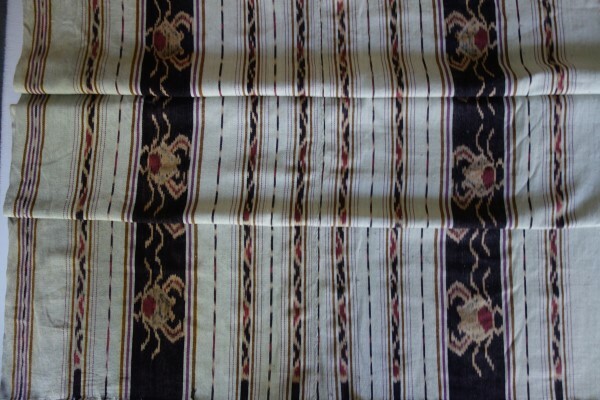 The shirt for a woman may be made from hand woven fabric but is usually a commercial blouse. 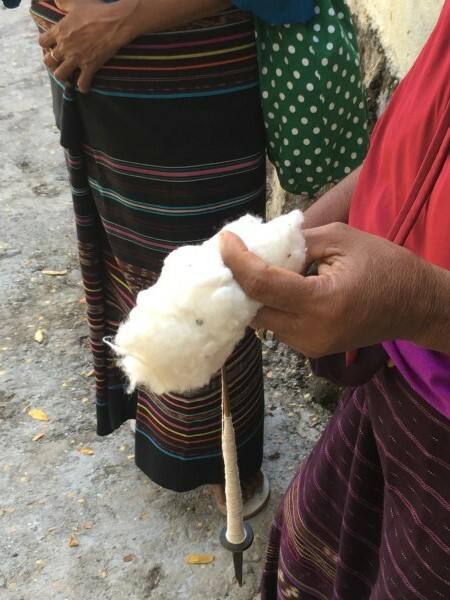 At the villages we did see demonstrations of the steps from cotton fibre through to weaving. In fact we were to see this a number of times both on the volcanic and limestone islands. 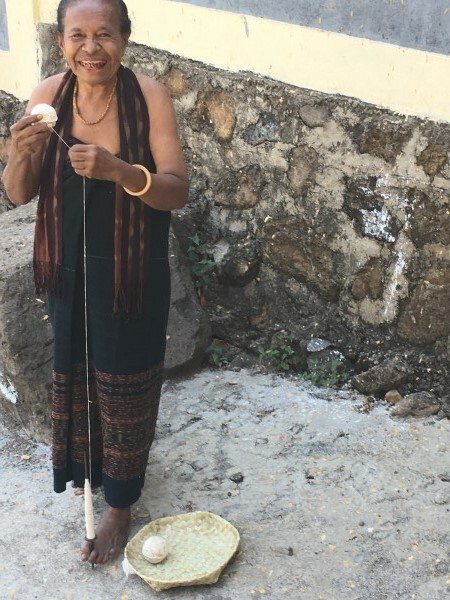 While they demonstrated spinning, it did not necessarily mean that they only used homespun. 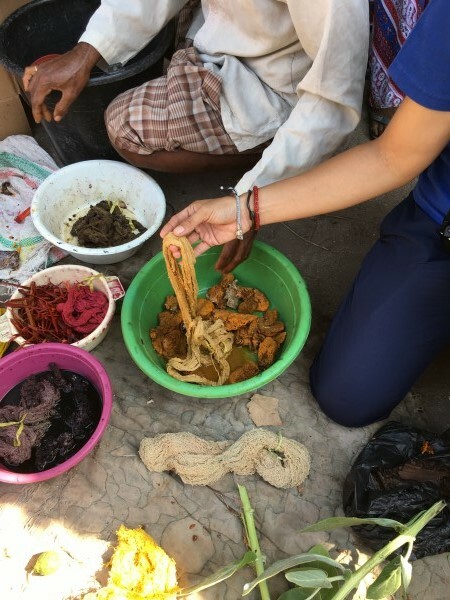 Here’s a pretty typical presentation that we saw throughout the trip; a collection from several places. Spinning is carried out on a drop spindle. The thread that is produced is fine and even. 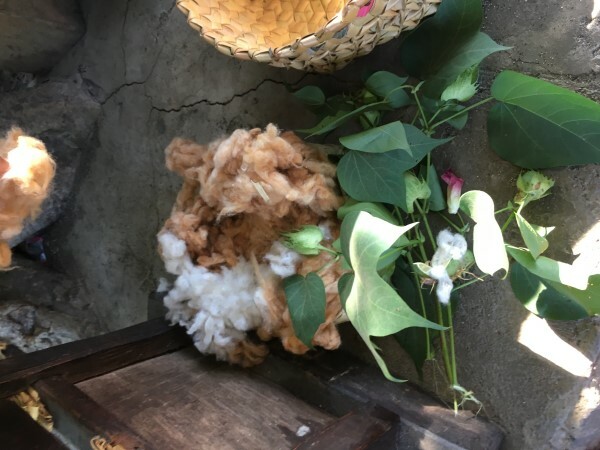 It is very labour intensive, Commercially spun cotton is also being used. Sometimes rayon was also used. 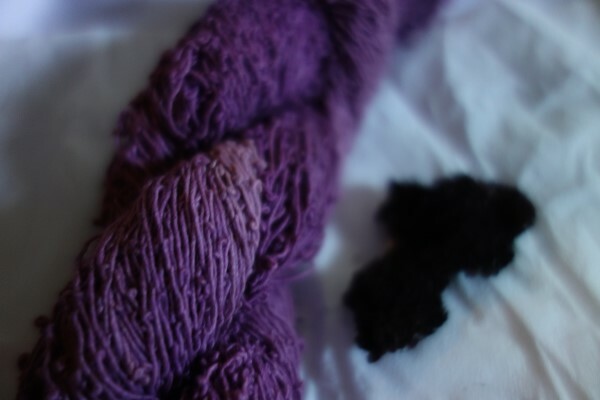 It dyes as well as cotton. 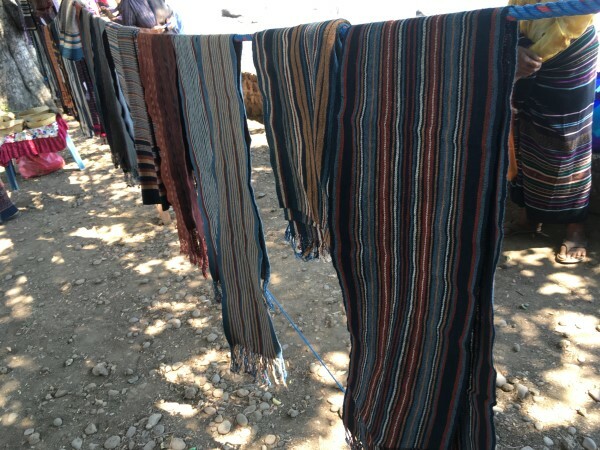 In the market place trust the feel of the fabric to tell you the fibre whether it is hand spun or commercial cotton or a much more drape-able rayon. 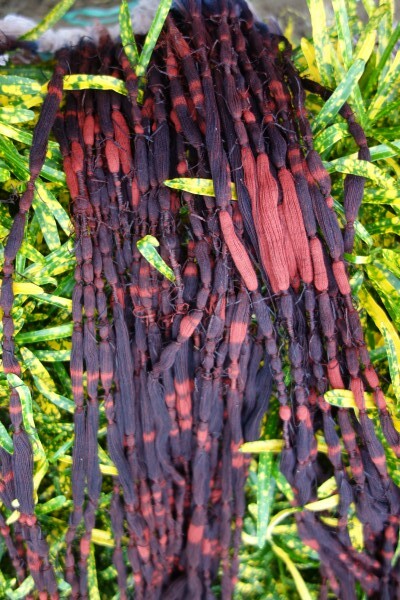 Dyeing is carried out on either a skein for the weft or solid colour warp, or on a wound and bound warp for ikat. More will be covered on these steps in a later blog. 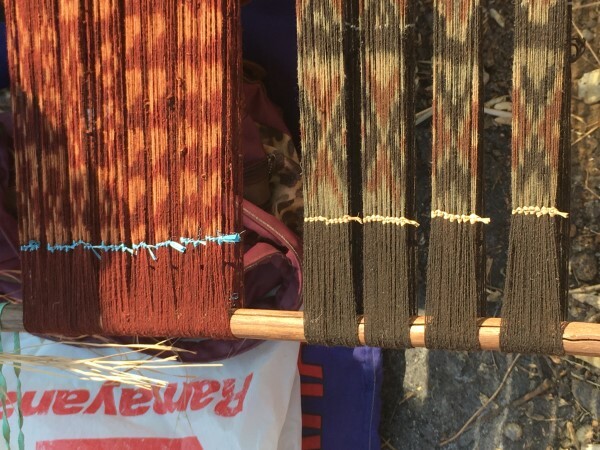 We’d see many versions of warps being put on a loom. 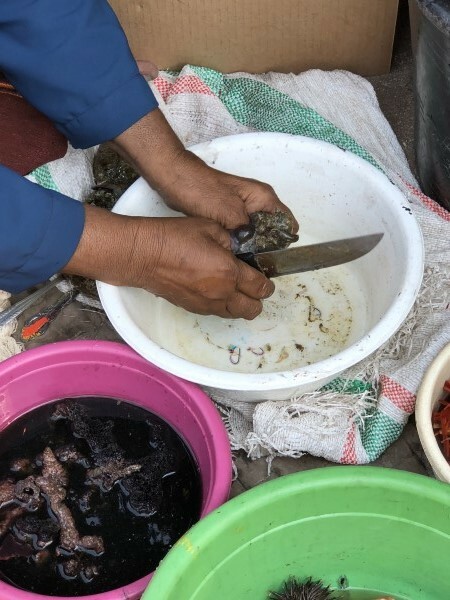 This is one in Kelompok Kapo Kale. 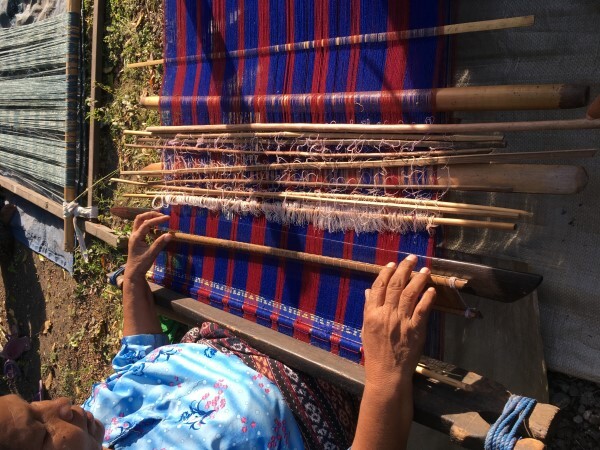 The warps are circular and need to be cut off the loom when weaving is finished. There will be just a small distance left unwoven. 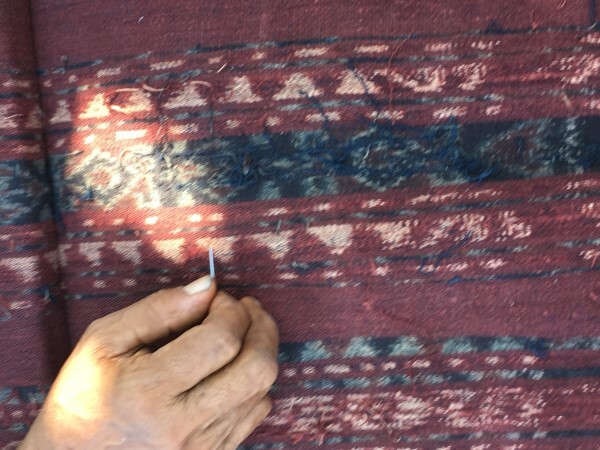 Much more detail will be provided on winding the warps, binding for ikat, putting the warps on a loom and weaving in a later blog. There’s way too much information for here. This is just an overview. Here’s an overview of what we saw and experienced. We arrived in Ende and drove across to Maumere staying in the Kelimutu Echo Lodge for two nights. 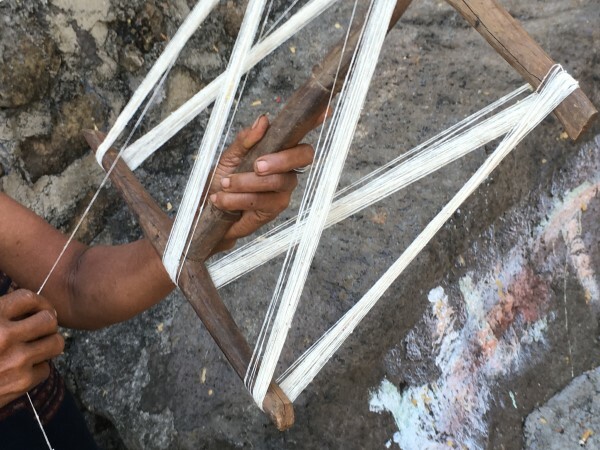 This gave us the opportunity to visit 3 weaving villages at Ndona, Kelompok Kapo Kale and Nggela. Travelling by road is challenging as they are not smooth or straight. 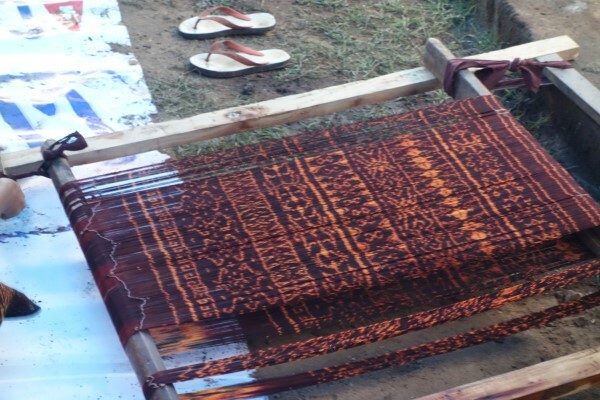 However it does give you the opportunity to look for looms or warps drying that may indicate the presence of weaving. I do like trying to get that glimpse into daily life as we travelled along these roads. 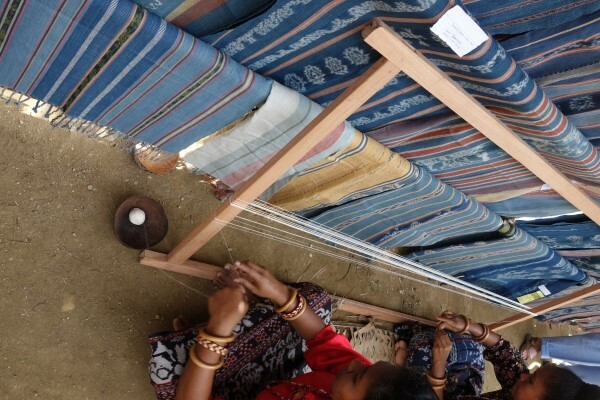 Weaving is done in the coastal villages. 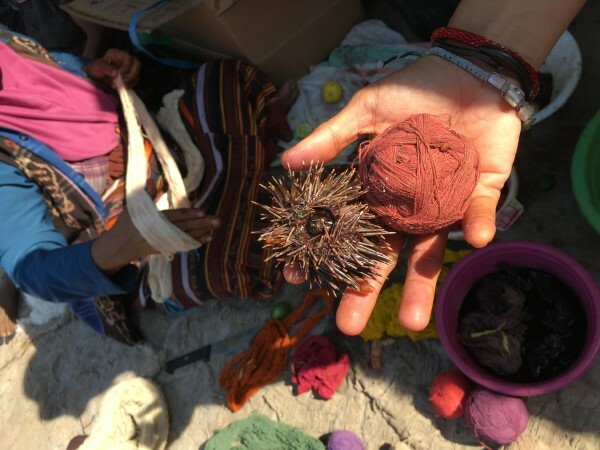 In the mountains at Saga, we were told that it is bad luck to weave. 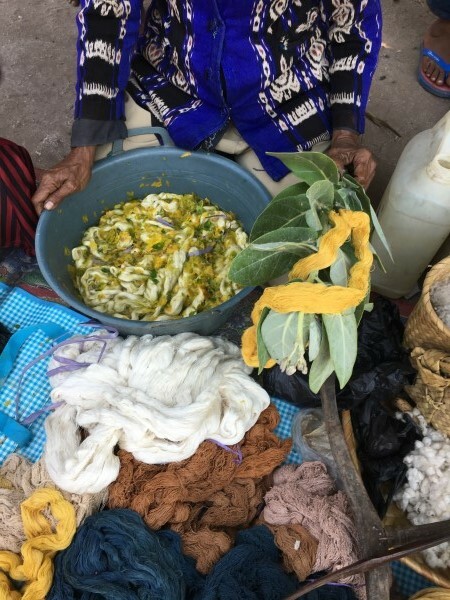 They acquire textiles by barter. 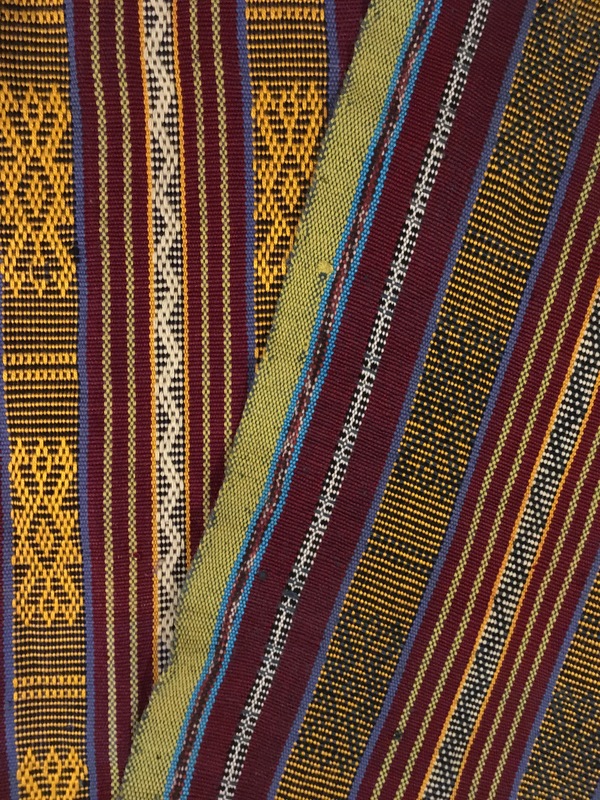 Here is a typical textiles from this region. 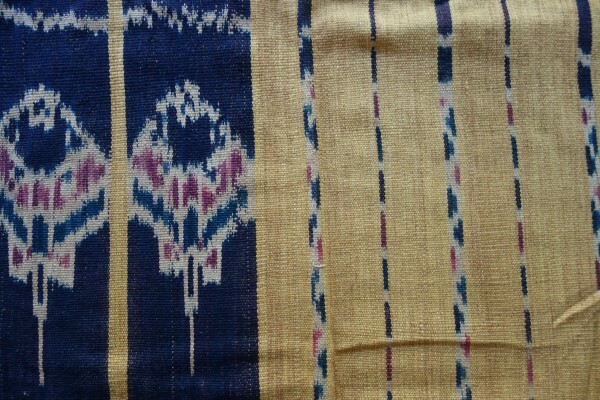 (Kelompok) Some of the images above are also from this area and show cloth. 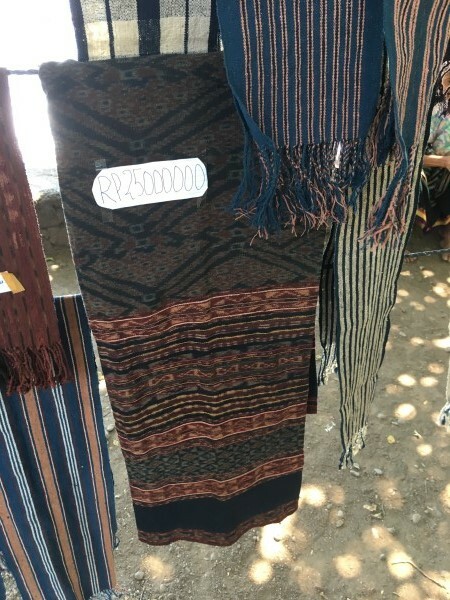 This market gives an idea of what was both on sale and what was worn. 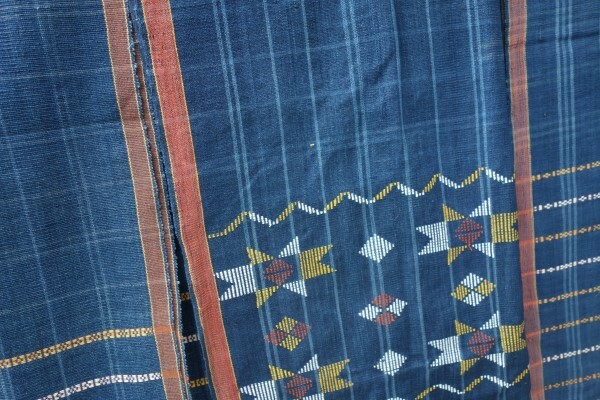 The dyes used here are synthetic but the colour aesthetics is typical: predominantly red/orange with some blue. And then it was time to board the boat. 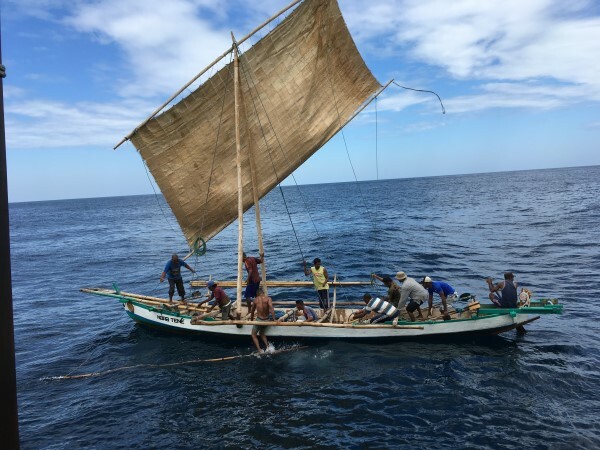 From Maumere we sailed to another village in Flores, Umauta. 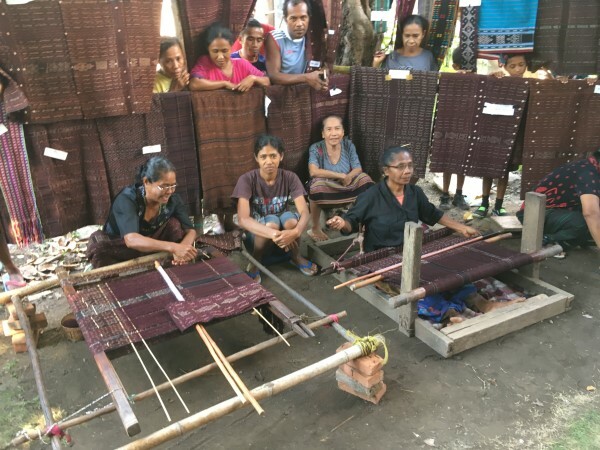 What was very interesting here was that we saw several forms of weaving. 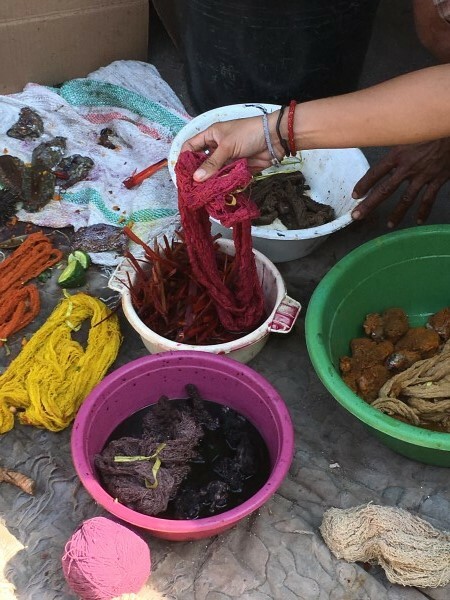 Cotton is used (handspun and commercial) with natural dyes (mainly morinda and indigo). 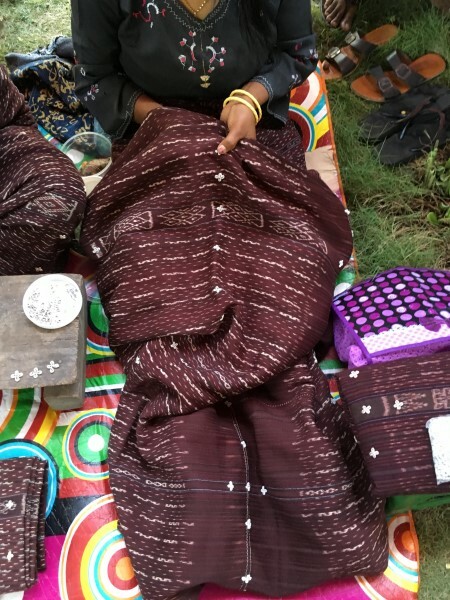 There was ikat; check out the skirts too. There were lots of interesting stripes. 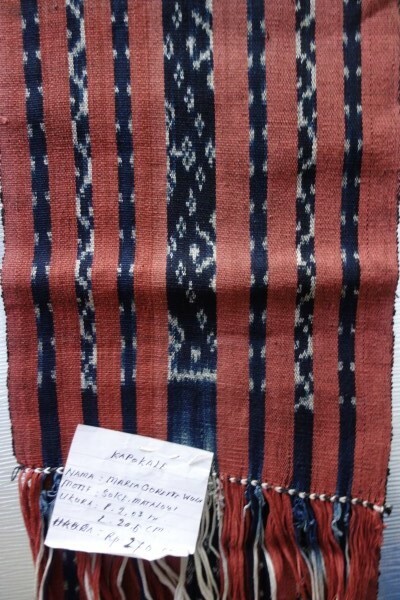 And fabrics that had supplementary weft patterning. Here’s a very interesting technique. 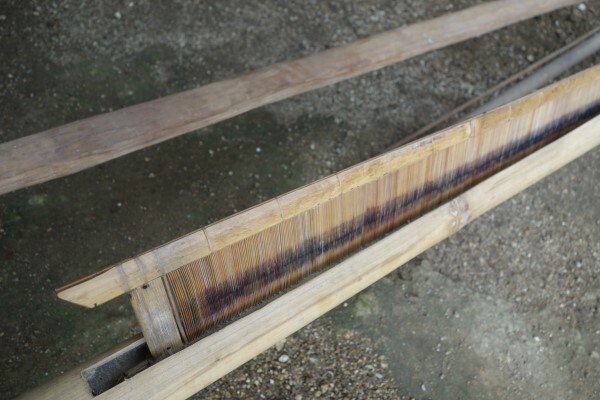 I had never seen a reed being used on a back strap loom. 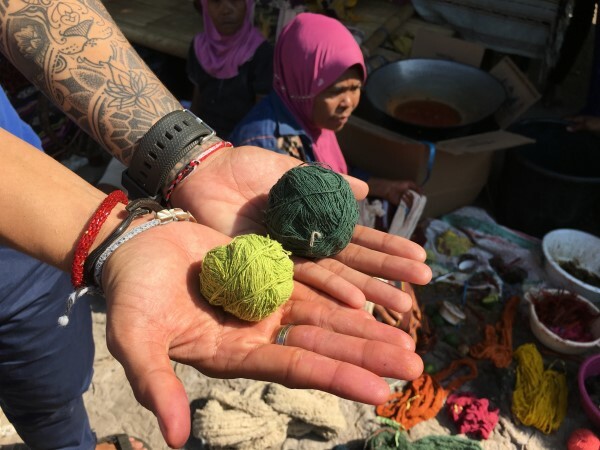 This simple technology resulted in a more open fabric. It is, when questioned, a traditional technique. As nowhere else was doing this, here is some information on this specialised technique. 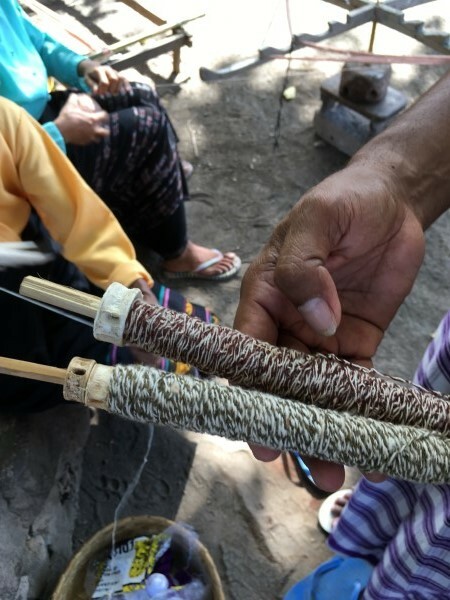 The trick is: how to put on a warp that is circular, that will be woven on a back strap loom AND that is threaded through a reed. A close up of the reed and a stand to stabilize it for threading. 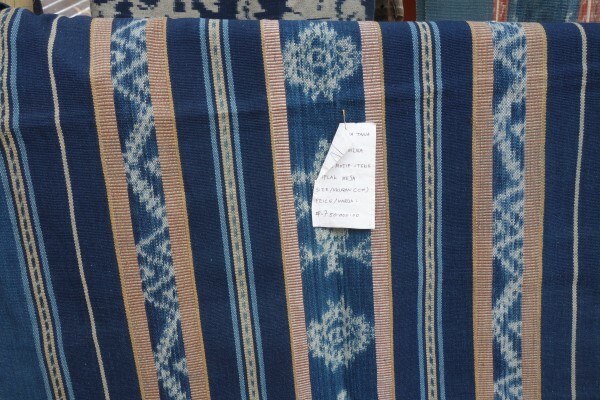 The spacing tells you how fine the fabric will be. Two threads go through each space or dent. 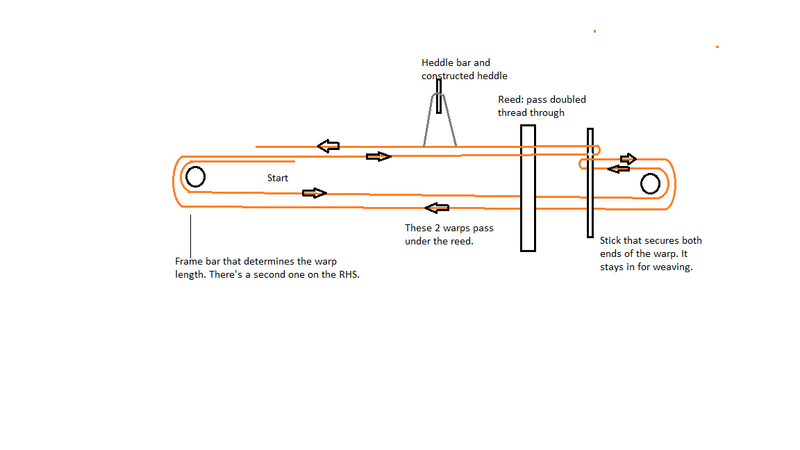 Winding the warp, creating heddles on one layer on every second warp thread and putting through the reed. Here’s a diagram that may explain it. 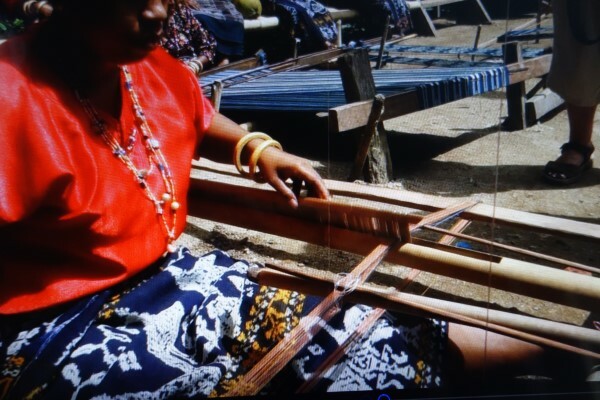 This movie shows the basic process of weaving with a reed on a backstrap loom.